“Every single day is a weekend." 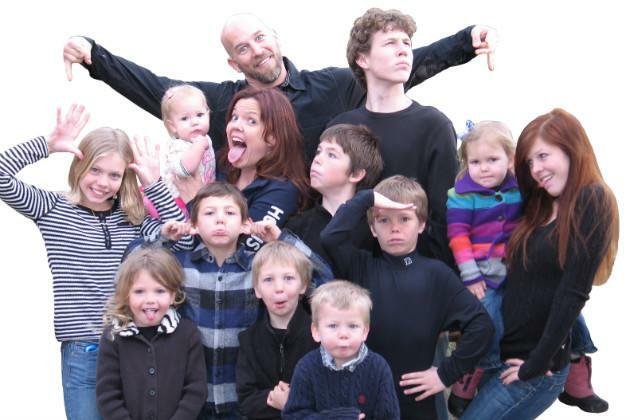 That's how Susie Kellogg, mother of 12, describes family life these days, after she and her husband, Dan, decided to sell their Glenwood Springs, Colorado home last fall, fill up an RV with their children—all of them—and travel the country in search of adventure. Permanently. All but one of the Kellogg children—aged 3 months to 19 years, each with names ending in a "y"—are home-, er, RV-schooled in the morning. In the afternoon, they explore: kayaking, hiking, camping—anything they want. “I want them to live life in the moment and not be living for tomorrow or ‘After my kids are grown’ or ‘Thank God it’s Friday,’” Susie added. The eldest child—Kerry, who graduated from high school last spring—gave up a chance to go to college, opting to join the family on the road and work on graphic design. The Kelloggs have a website (KelloggShow.com), Twitter feed, Facebook page and YouTube channel to document their travels and promote their unusual way of life. They even penned a parenting guide—"Raising a Badass Family"—that Dan calls "a ramped-up, modern version of that which Dr. Spock and Dr. T. Berry Brazelton pioneered in both the 1940s and 1990s." Filled with practical and compassionate advice for both new parents as well as those knee-deep in their parenting journey, it is a must read for all anxious parents, those suffering from parenting overload and those that simply need a swift kick in the pants. "Raising a Badass Family" delves deeply into the hot issues parents must face today, such as spanking, co-sleeping, daycare, homeschooling, raising teens and so much more. It's like a real-life, supersized version of the Griswolds. The Kellogg kids are undeniably close—both figuratively and literally—but Susie says the children are encouraged to socialize, even on the road. "Our kids encourage each other, they coach each other, they police each other and they love each other," Susie wrote in a recent blog post. "They have built-in BFFs and they are meeting new people in every new stop—both kids and adults." This lifestyle also allows our kids to remain kids for as long as they wish. They run, climb trees, build fires, play pranks, wrestle, yell, scream, holler and laugh all day everyday. Dally summed up the enticement of RV life in one simple sentence: “I like having my house on wheels because I can go anywhere I want without having to pack and plan.” Yes! Freedom. Freedom to do whatever we want, whenever we want! We don’t play well by other people’s rules. We don’t like to be told what we can and cannot do. This nomad life is exactly what we were born to do! And it doesn’t hurt that sometimes we are treated like rock stars by people who recognize us from YouTube or our blog! I wouldn’t trade my life for anything in the world.